Are you having any difficulty seeing? Have you been told there is prism or slab off in your lenses? Do you have a copy of your eyeglass and/or contact lens prescription? Check any of the following you have had or are known to have. Check any of the following medical conditions that apply to you. Check any of the following that your blood relatives have had. It may be necessary to dilate your eyes during your eye examination or treatment. Dilation results in light sensitivity and an inability to see clearly for a few hours. We provide free disposable sunglasses. Patients would wear sunglasses outdoor and be cautious when walking and going up or down stairs. We recommend that you not drive or operate dangerous machinery immediately after dilation. We also recommend that someone accompany you to your appointment to drive you home, or that you wait until your eyes return to normal so that you can drive safely. The refraction is the part of the eye exam that determines your best corrected vision and if you need corrective eyeglasses. It is an essential part of an eye examination and is necessary to write a prescription for glasses. Refraction is NOT a covered service by Medicare or most insurance plans. These plans consider refraction a "vision" service rather that a "medical" service. The refraction fee is collected at the time of service in addition to any copayment your insurance plan may require. Should your insurance plan pay us for the refraction, we will reimburse you accordingly. *NOTE: It is the patient’s responsibility to file insurance claims if we are not contracted with your insurance company. *NOTE: Be aware that most medical insurance plans do not cover Routine Exams, Refractions or Contact Lens Analysis. Your doctor will accept the fee approved by Medicare as payment in full for any covered services. The patient will be responsible for any amount approved but not paid by Medicare (the 20% co-payment and the annual deductible) as well as the full amount for all non-covered services. Most diagnostic eye examinations and tests are covered by Medicare, however, refractions and the fitting and supply of glasses and contact lenses are non-covered services. George M. Salib, M.D. is licensed and regulated by the Medical Board of California. This notice describes how medical information about you may be used and disclosed and how you can get access to this information. Please review it carefully. If you have any questions about this notice, please contact George M. Salib, M.D. at (949) 770-1322. This notice describes the privacy practices at our office. *Maintain the privacy of protected health information. *Give you this notice of our legal duties and privacy practice regarding your health information. *Follow the terms of this notice currently in effect. Described as follows are the ways we may use and disclose your health information. Except for the following purposes we will use and disclose your health information only with your written permission. You may revoke such permission at any time by writing to George M. Salib, M.D. Treatment - We may use and disclose your health information for your treatment and to provide you with treatment-related health care services. For example, we may disclose your health information to doctors, nurses, technicians, or other personnel, including people outside our office, who are involved in your medical care and need the information to provide you with medical care. Payment - We may use and disclose your health information so that others or we may bill and receive payment for you, an insurance company, or a third party for the treatment and services you received. For example, we may give information to your health plan so that they will pay for your treatment. Health Care Operations - We may use and disclose your health information to evaluate and improve our medical care and to operate and manage our office. For example, we may use and disclose information to a peer review organization or a health plan that is evaluating our care. We may also share information with others that have a relationship with you for their health care operation activities. Appointment Reminder, Treatment Alternatives and Health-Related Benefits and Services - We may use and disclose your health information to contact you and remind you of your appointment, to tell you about treatment alternatives or health-related benefits and services you could use. Individuals Involved in Your Care or Payment for Your Care - When appropriate, we may share your health information with a person involved in, or paying for, your care (such as your family or a close friend). We may notify your family about your location or condition or disclose such information to an entity assisting in disaster relief. Research - We may use and disclose your health information for research. For example, a research project may involve comparing the health of patients who received one treatment to those who received another for the same condition. Before we do so, the project needs to go through a special approval process. Even without special approval, we may permit researchers to look at records to help identify patients who may be included in their research, as long as they do not remove or copy any of your health information. As Required by Law - We will disclose your health information when required to do so by international, federal, state or local law. To Avert a Serious Threat to Health or Safety - We may use and disclose your health information when necessary to prevent a serious threat to the health and safety of you, another person, or the public. Disclosures will be made only to someone who can prevent the treatment. Business Associates - We may disclose your health information to our business associates that perform functions on our behalf or provide us with services if necessary. For example, we may use another company to perform billing services on our behalf. All of our business associates are obligated to protect the privacy of your information and are not allowed to use or disclose the information for any other purpose than appears in their contract with us. Military and Veterans - If you are a member of the armed forces, we may release your health information as required by military command authorities. If you are a member of a foreign military we may release your health information to the foreign military command authority. Worker's Compensation - We may release your health information for worker's compensation or similar programs that provide benefits for work-related injuries or illness. Public Health Risks - We may disclose your health information for public health activities to prevent or control disease, injury or disability. We may use your health information in reporting births or deaths, suspected child abuse or neglect, medication reactions or product malfunctions or injuries, and product recall notifications. We may use your health information to notify someone who may have been exposed to a disease or may be at risk for contracting or spreading a disease or condition. If we are concerned that a patient may have been a victim of abuse, neglect, or domestic violence we may ask your permission to make a disclosure to an appropriate government authority. We will make that disclosure only when you agree or when required to do so by law. Health Oversight Activities - We may disclose your health information to a health oversight agency for activities authorized by law. These may include audits, investigations, inspections, and licensure. These activities are necessary for the government to monitor the health care system, government programs, and compliance with civil rights laws. Lawsuits and Disputes - If you are involved in a lawsuit or dispute, we may disclose your health information in response to a court or administrative order. We may disclose your health information in response to a subpoena, discovery request, or other lawful process by someone else involved in the dispute, but only if efforts have been made to tell you about the request or to obtain an order protecting the information requested. Law Enforcement - We may release your health information request by law enforcement official if 1)there is a court order, subpoena, warrant, summons or similar process; 2)if the request is limited to information needed to identify or locate a suspect, fugitive, material witness, or missing person; 3)the information is about the victim of a crime even if, under certain very limited circumstances, we are unable to obtain your agreement; 4)the information is about a death that may be the result of criminal conduct; 5)the information is relevant to criminal conduct on our premises; and 6)it is needed in an emergency to report a crime, the location of a crime or victims, or the identity, description, or location of the person who may have committed the crime. Coroners, Medical Examiners, and Funeral Directors - We may release your health information to a coroner, medical examiner, or funeral director to identify a deceased person or cause of death, or other similar circumstance. National Security and Intelligence Activities - We may disclose your health information to authorized federal officials for intelligence and other national security activities authorized by law. Inmates or Individuals in Custody - If you are an inmate of a correctional institution or in custody we may disclose your information. 1)for the institution to provide you with health care, 2)to protect your health and safety or that of others and 3)for the safety and security of the institution. Right to Inspect and Copy - You have the right to inspect and copy your medical and billing records by written request to George M. Salib, M.D. Right to Amend - You have the right to request an amendment to your records by written request to George M. Salib, M.D. Right to an Accounting of Disclosures - You have a right to an accounting of certain disclosures by written request to George M. Salib, M.D. Right to Request Restrictions - You have the right to request restriction or limitation on your health information used for treatment, payment or health care operations. You may request us to limit disclosure to someone involved in your care or in payment for your care (such as a spouse) by written request to George M. Salib, M.D. We are not required to agree with your request, but we will try to comply. Right to Request Confidential Communication - You have the right to request that we communicate with you about medical matters in a certain way or at a certain location. You can ask, for example, that we contact you only by mail or at work. 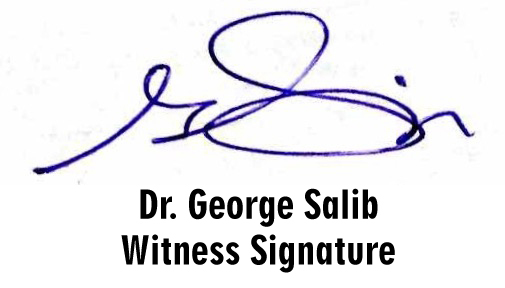 Your written request must specify how or where you wish to be contacted and be addressed to George M. Salib, M.D. We will accommodate reasonable requests. We may change this notice and make it effective for medical information we already have about you as well as new information. The current notice will be posted and available at all times. You have a right to request a paper copy of the current notice a the any visit or by written request to George M. Salib, M.D. Article 1: Agreement to Arbitrate: It is understood that any dispute as to medical malpractice, that is as to whether any medical services rendered under this contract were unnecessary or unauthorized or were improperly, negligently, or incompetently rendered, will be determined by submission to arbitration as provided by California law, and not by a lawsuit or resort to court process except as California law provides for judicial review of arbitration proceedings. Both parties to this contract, by entering into it, are giving up their constitutional right to have any such dispute decided in a court of law before a jury, and instead are accepting the use of arbitration. All claims for monetary damages exceeding the jurisdictional limit of the small claims court against the physician, and the physician's partners, associates, association, corporation or partnership, and the employees, agents and estates of any of them, must be arbitrated Including, without limitation, claims for loss of consortium, wrongful death, emotional distress or punitive damages. Filing of any action In any court by the physician or patient to collect or contest any medical fee shall not waive the right to compel arbitration of any malpractice claim. However, following the assertion of any malpractice claim, any fee dispute, whether or not the subject of any existing court action, shall also be resolved by arbitration. Article 3: Procedures and Applicable Law: A demand for arbitration must be communicated In writing to all parties. Each party shall select an arbitrator (party arbitrator) within thirty days and a third arbitrator (neutral arbitrator) shall be selected by the arbitrators appointed by the parties within thirty days of a demand for a neutral arbitrator by either party. Each party to the arbitration shall pay such party's pro rata share of the expenses and fees of the neutral arbitrator, together with other expenses of the arbitration incurred or approved by the neutral arbitrator, not Including counsel fees or witness fees, or other expenses Incurred by a party for such party's own benefit. The parties agree that the arbitrators have the immunity of a judicial officer from civil liability when acting In the capacity of arbitrator under this contract. This Immunity shall supplement, not supplant, any other applicable statutory or common law. Article 4: General Provisions: All claims based upon the same Incident, transaction or related circumstances shall be arbitrated in one proceeding. A claim shall be waived and forever barred If (1) on the date notice thereof Is received, the claim. If asserted in a civil action, would be barred by the applicable California statute of limitations, or (2) the claimant fells to pursue the arbitration claim In accordance with the procedures prescribed herein with reasonable diligence. With respect to any matter not herein expressly provided for, the arbitrators shall be governed by the California Code of Civil Procedure provisions relating to arbitration.